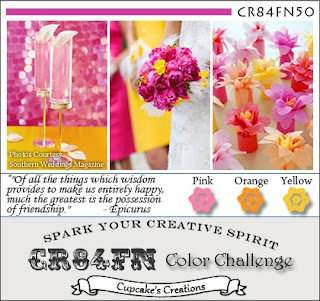 Here are the Wonderful CR84FN colors..
For all the CR84FN Challenge details, please be sure to visit the CR84FN Blog. And Please do go and check out the Wonderful creations the Super talented DT has cooked up for your inspiration.. Sure hope you can join us! Very pretty card Shannon! Love the PTI teapot and the sweet daisies! Thanks for sharing your beautiful creations with us! A fabulous card Shannon, love that sweet teapot and pretty mat shape. A fab mix opapers and textures too! This is just so darn cute, Shannon! The pretty colors and those daisies with the button centers really make it eye catching. I'm not good about keeping get well cards in my stash. I should work on that. Thanks for always being an inspiration! I'm just loving this wonderful color combination the more I see it, and you've created the perfect card with it! I love the elements and accents with the cute teapot and buttons! That's the perfect sentiment too! LOVE this!! This is gorgeous Shannon!! I love the beautiful colors and that sweet teapot! Fabulous flowers...and cute buttons!!! I hope you have a wonderful week! Hi Shannon - what a beautiful card. Lovely colors. Cute, cute, cute! Love the colors and the little buttons are perfect! This cheery get well card is so pretty, Shannon. It will definitely make the receiver feel better, just by looking at those cheery colors and the great LO. This is so fabulous Shannon! Gorgeous take on the colours and love the embellishing! Shannon So glad to have you as a guest designer with us this month! Fantastic card and beautiful design! Shannon, you have been such a GREAT guest designer with all of your PRETTY cards! 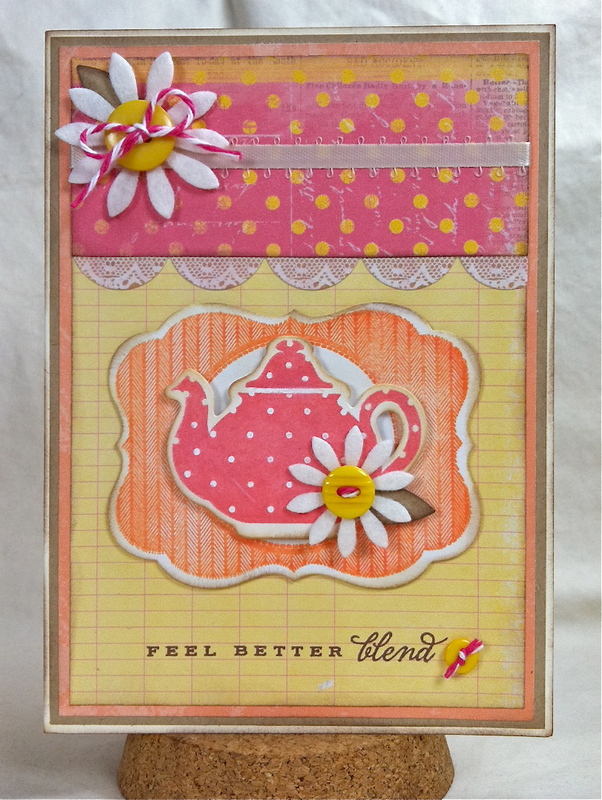 LOVE this Get well card with all your new goodies! LOVE the scallop with the lace image and LOVE the teapot and orange stamp on the Mat! Also that little button with twine is a FAB detail! This card would surely cheer anyone up! So pretty! LOVE the colors on this one and those daisies are the perfect little accents with there button centers. Hope you had a lovely weekend! Love this cute polka dot PTI teapot. Really need to get this set, my mom has a teapot collection. You scalloped border die done up in lace paper is the perfect touch here! Perfect get well card! Love the image with the tea pot with the papers, so pretty with the wonderful spring colors. Beautiful, Shannon! Wonderful mix of patters and dies! Thanks for being such a FAB guest designer! Oh my goodness - I love this teapot - your design and the colors!!!!! I'm a Weekly Favorite at SCS!! Top 3 at Paper and Such! Featured on Best Of The Web! Top 3 at Whimsie Doodles! Card of the Week at Whimsie Doodles! Top 3 at The Sweet Stop! Thanks Ms. Donna & Ms.Cheryl! Best 'O Luck.. - SSSC154 GD!